1968 features one of the most desirable rookie cards of the vintage era in Nolan Ryan. Part of a 598 card base set. While I wasn't lucky enough to find one of those gems, of the (36) cards, here are some of the more notable names. According to the Baseball Almanac, several major events took place off the field regarding rules, licensing, divisions and contracts. The Players Relations Committee and Players Consistency Association signed the first Major League Baseball "basic agreement" which increased the league's minimum salary to $10,000 and identified a formal grievance procedure. Both sides also agreed to explore the options for a reserve clause. The Major League Players Association signed a major card contract worth millions with the Topps baseball card company. The Baseball Rules Committee made several major changes to the game resulting in the most modifications to be implemented at one time in the history of the game. They included: the pitcher's mound being lowered from fifteen inches to ten, the strike zone being decreased from the shoulders-to-knees to armpits-to-knees, tighter enforcement and penalties for illegal pitches, extra-inning ties resuming from the point of interruption instead of being replayed and finally the study of artificial surfaces on ball fields and the pros and cons of turf. Both the American and National Leagues restructured their divisions resulting in the AL East consisting of Baltimore, Boston, Cleveland, Detroit, New York and Washington, the AL West including California, Chicago, Kansas City, Minnesota, Oakland and Seattle, the NL East featuring Chicago, Montreal, New York, Philadelphia, Pittsburgh and St. Louis and the NL West claiming Atlanta, Cincinnati, Houston, Los Angeles, San Diego and San Francisco. On the field Pete Rose won the league batting title with a .335 average, Frank Howard led the majors with 44 HR's, and Ken Harrelson tallied 109 RBI. Denny McLain racked up 31 Wins for the Tigers while Bob Gibson yielded a miniscule 1.12 ERA, the second lowest ever. The Detroit Tigers won the World Series in 7 games over the St. Louis Cardinals. Of no suprise, Denny McLain won the MVP and the Cy Young. 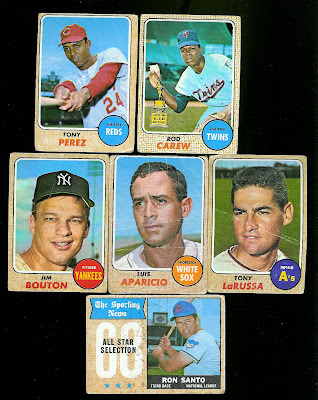 In some ways 1968 was kind of the beginning of the end for making of the simple cheap sport cards. I guess anytime you pay millions for something it begins to catch someones interest. I think in 1968 Topps expanded their NHL set to include all teams. In 1969 the NBA got in on the action and got its first basketball cards/license in 8years. Then the prelude to big bucks in 1970 the NFL wanted Topps to pay for the right to show the logos on cards (they didn't) thus there were no NFL logos on Topps cards in the 1970s. It will be great to watch Detroit Tigers,i have bought tickets from http://ticketfront.com/event/Detroit_Tigers-tickets looking forward to it.